Handmade Christmas decorations are just too fun to pass up during the holiday season. This DIY Christmas garland is a fun, simple project that you can put together in an afternoon, and use it to deck your halls by evening. 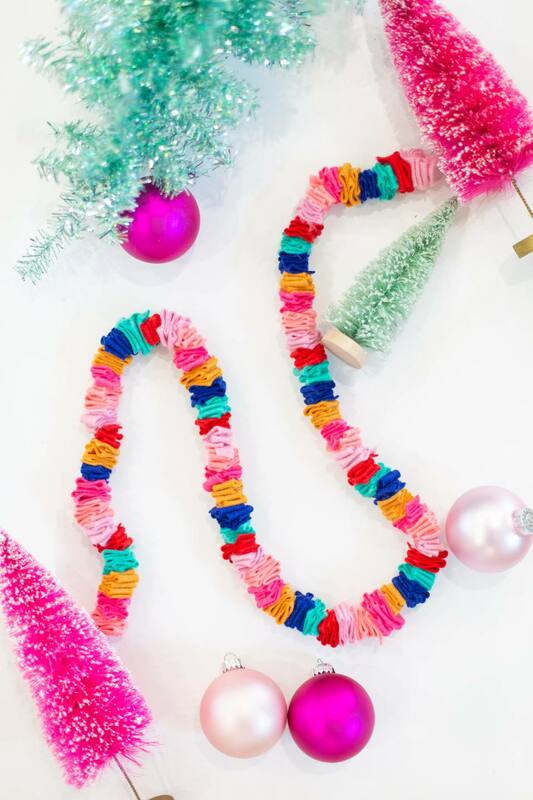 The felt lends a cozy feel to this pretty garland, while the bright colors add a happy touch to your holiday decor! Customize the colors to fit in your favorite palette, and make these as long or as short as you need them. 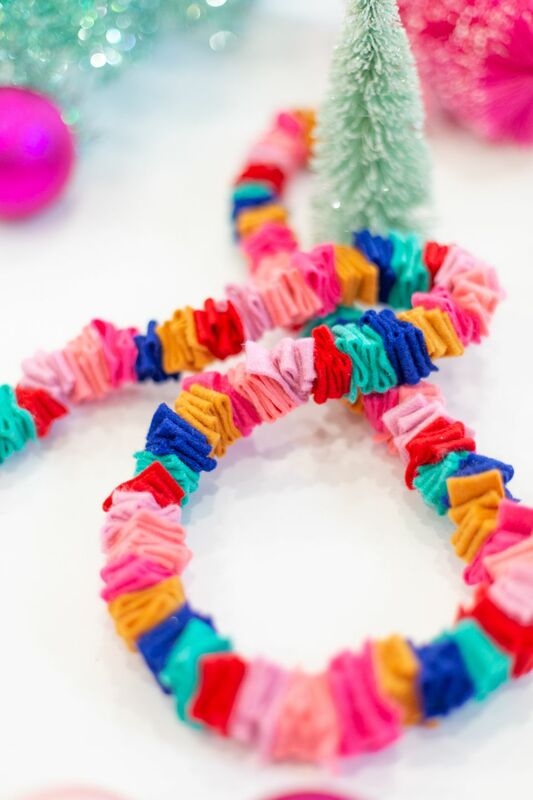 Get your friends together to make these pretty garlands for a holiday crafternoon! Felt is such a versatile material, and this project can nicely utilize any felt scraps that you may have laying around. No need for high-quality felt material for this project; the felt that you can find in the kids' section of any craft store will yield a perfect result. Consider your color selection as you are choosing pieces to work with; go for a traditional holiday palette of red and green, or branch out into some bright colors for whimsical decor. Cut your felt into strips that are approximately 3/4" wide and 8" long. These measurements are quite flexible, so experiment a bit and see what dimensions work best for you. The cutting is most easily and quickly done with a sharp paper cutter, if you have one available—if not, scissors work well, too. Thread your needle with about 4 feet of thread. Insert one end through the needle and leave a short tail. On the long tail, tie an extra large double knot at the end thick enough to keep the felt from coming off the end of the thread. Take a strip of felt between your fingers and fold it accordion style. Pinch it between your fingers so that the according stays intact. Insert the needle through the accordion of felt, making sure that it pierces every layer and doesn't bypass any. Pull the felt accordion all the way onto the long end of the thread until it bumps up against the knot at the end. Continue adding pieces in the same manner. Decide here whether you'd like to have a color pattern or add your pieces on in a random color order. With each strip of felt, fold it into an accordion and thread it onto the needle in the same manner. Press the pieces together as you go. The most recent piece that you string on may unfold a bit, but as you add more felt, the accordions will become compressed and maintain their shape. Once you are near the end of the thread, string on your final felt pieces. Remove the thread from the needle. Compress the pieces of felt on the thread slightly and tie another thick double knot at this end of the string to keep the felt in place on the garland. Once your garland is knotted, use your hands to twist and fluff the felt so that the accordions aren't entirely uniform. Rotate the felt around the thread so that it appears fuller and a bit more randomized. Add your garland to a tree, mantel, doorway, or any place that needs a little festive decor!